ON AMY SHERMAN-PALLADINO’S The Marvelous Mrs. Maisel, Jewish characters and their community are the default. The entire ecosystem of Mrs. Maisel — their friends and neighbors, their temple and deli — develops within an incredibly specific and incredibly narrow segment of society: that of the well-heeled Ashkenazi Jewish Upper West Siders. Everyone else we meet is given the treatment Jewish characters usually merit on shows with an assumed secular-ish Christianity: they’re outsiders, and often consciously so, both to the characters and, in turn, to the viewer. When we’re treated to a flashback of Midge dithering with the incredibly named Palmer Witherspoon — decidedly not a Jew — he sticks out like a pink-and-blond sore thumb from the rest of what we’ve seen. And we feel just as strange as Joel undoubtedly does in that moment, watching the couple before he swoops in to rescue Midge from an inevitable evening of WASP dullness — to dazzle Midge with recognizable and familiar Jewish rapid-fire wit and eventually win her hand. When Midge visits Joel and Penny’s new apartment in episode four (“The Disappointment of the Dionne Quintuplets”), she’s nearly undone by the fact that Joel has seemingly swapped a Jewish girl for a Christian one, living the “Methodist version” of their lives. Just trade in brisket for its (apparently) Methodist doppelgänger pot roast. The exquisitely detailed, largely untranslated, world of Ashkenazi Jews in the Upper West Side is Mrs. Maisel’s norm. And that’s not a small thing. As someone who was raised in an upper-middle-class Ashkenazi Jewish family, The Marvelous Mrs. Maisel is not only speaking my language, but also showing me a cinematic version of my own Jewish New Yorker ancestors. When Shirley Maisel begins singing “Mairzy Doats” absent-mindedly to herself in episode seven, my reaction was to begin screaming. I had learned that song from my Jewish grandmother, and had never heard it in a piece of media before. The song itself isn’t Jewish per se, à la “Dreidel Dreidel Dreidel,” though it was co-created by Jewish musicians Milton Drake and Al Hoffman, but, all the same, it’s a part of a cultural inheritance that signifies in very specific ways. (And, after appearing on Twin Peaks, it’s having a bit of a comeback, apparently.) A friend with whom I went to Hebrew school confirmed that I wasn’t going crazy noticing how deeply textured The Marvelous Mrs. Maisel’s Jewish culture is, jubilantly accusing the show of eavesdropping on her own family for fodder for that Chinese restaurant sequence in episode six (“Mrs. X at the Gaslight”). A character’s deli order of chopped liver on challah (episode five, “Doink”) had me both salivating and wondering when I could next get to my grandparents’ house (the love of chopped liver in my family skipped a generation). Not since the Rugrats indulged us with both Hanukkah and Passover special episodes, casting Tommy Pickles (what a name) as Judah Maccabee and Moses, have I felt so catered to by a television program. Taking the step of normalizing the Yiddishkeit of the world of The Marvelous Mrs. Maisel isn’t just about representation. 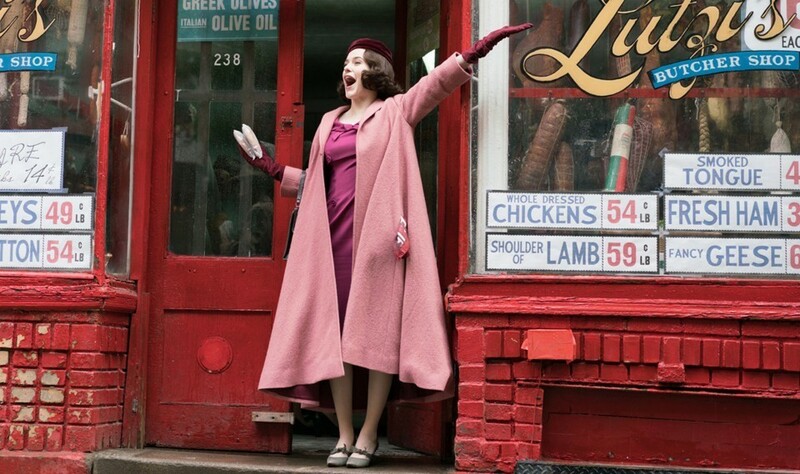 Because Sherman-Palladino doesn’t handle the in-group minutiae of Upper West Side Jewish life with kid gloves for gentile viewers, the narrative actually gets a little complicated about how the individuals and families that make up this narrow slice of life are different — not only from an otherwise normative Christian society, but also from one another. Yet The Marvelous Mrs. Maisel is smart enough to know when to lean into stereotypes, only to pull the rug out from under the viewer by complicating that stereotype. As we come to learn over the course of the season, Moishe is actually a more nuanced mix of antagonist and anti-hero. We learn in episode two (“Ya Shivu v Bolshom Dome Na Kholme”), that he rescued a number of Jews from Germany (at great personal expense) during World War II, a fact that Moishe will never let anyone forget. And why should he? Yet, as Abe points out, Moishe wasn’t only being selfless and heroic when he rescued those German Jews — he put them straight to work in his garment factory in less-than-ideal conditions. For Moishe Maisel, doing the right thing has to be balanced with doing the profitable thing. His status as a would-be folk hero is inseparable from just how eagerly he tries to mythologize himself. He’s an exception, an outlier, and a stereotype — a frustratingly, convincingly human figure. Furthermore, in the context of 1950s New York, even behavior that might seem cliched or expected takes on a new level of poignancy. When Rose Weissman and Shirley Maisel worry about Joel’s and Midge’s marriage, with Moishe and Abe variously attempting to run interference to bring them back together, it’s not just to provoke a yuk about overbearing Jewish families. It’s not mentioned explicitly, but it’s not a stretch to read the four parents’ efforts, misguided as they are, as stemming from a very real and tangible fear about the future of the continued existence of the Jewish people in a post-Holocaust world. When Rose discusses how she’s told Midge to have another child to get “three before thirty,” she’s not just annoyingly pushing Midge further into her role as a subservient housewife and mother — although she is, at that — but she’s thinking of where her family stands in that moment, with the weight of six million missing Jews hanging over her head. Sherman-Palladino never overplays this aspect, but there are historical ghosts haunting every scene. Our characters see them, even if the audience doesn’t. Mrs. Maisel even addresses conversion in a nuanced way — albeit briefly, and laced with the show’s signature wit. In the world of Mrs. Maisel, being Jewish is so commonplace that it’s Midge’s brother’s wife Astrid, a convert, who feels out of place when we meet her in episode six. In an effort to prove her dedication to being Jewish, she arrives at the Weissman’s dinner party with homemade gefilte fish and several giant mezuzahs all the way from Israel, where she’s visited a whopping 11 times. Astrid’s cartoonishly scaled Judaica represents the difference between knowledge and belonging, the perspective of an outsider approximating a Jewish culture she can’t fully inhabit. The instant Midge and Rose seem apprehensive about their mezuzahs, Astrid frantically offers to return them, desperate for their approval. Yet Astrid is accepted by the Weissmans as a convert, despite the fact that her gefilte fish will go forever uneaten, and is largely welcomed into the family, treated more as an odd duck whose zeal to be Jewish is a bit too strong than with any resentment or animosity. But it’s this subtlety of exclusion and inclusion that marks what Mrs. Maisel is doing as special. In a parallel scene, Joel’s parents meet Penny, the aforementioned WASP. They are effervescent in their welcoming of Joel’s new girl, and yet, when she disappears to the bathroom, they are unambiguous about their feeling that she does not belong. Astrid’s acceptance, on the other hand, is not provisional, but it’s also not without complication. She’s enough a part of the family to be able to see the limits of her own inclusion. Penny, on the other hand, won’t ever see how different they perceive her to be. The Yiddishkeit of Mrs. Maisel’s bohemian downtown crew isn’t made as explicit, but still provides yet another facet to the many already visible in the show’s snapshot of Jewish life. Jews were a major part of the counterculture movement coming up on the heels of Mrs. Maisel’s 1958 New York, and their presence can be felt both in the real-life individuals borrowed from history as well as the original characters. Midge herself is based on Joan Rivers, and briefly considers using the moniker “Fanny Brice” (as in the famous Jewish comedienne) as a stage name. Lenny Bruce (born Leonard Alfred Schneider) drops in and out of the frame as some kind of comedy wish-fulfillment guardian angel-slash-weed dealer. Jewish comedian Buddy Hackett (who went on one date with my Jewish great-aunt several years before Mrs. Maisel is set) gets a name drop; Harry Drake, the irascible comedy mogul played by David Paymer, is an original character likely inspired by Jack Rollins (born Jacob Rabinowitz). This isn’t Mad Men’s midcentury Manhattan. Meghan Daum has an at-times off-putting essay called “American Shiksa” that details her various relationships with Jewish men, who, in her telling, were drawn to her WASPy submissiveness and ability to laugh and smile and say, “that’s interesting.” Where Jewish women are bright, challenging, and demanding, Daum writes, WASP women such as herself represented an appealing (and rebellious) alternative. Meanwhile, Daum writes, she got to enjoy the wit and neuroticism she projects onto all Jewish men as a matter of course; she exoticizes and basically fetishizes the kinds of conversations she imagines Jews having at the dinner table — far more substantive and argumentative than her family’s own (surely pot-roast-laden) affairs. I have to wonder if the writing staff of Mrs. Maisel turned to “American Shiksa” when constructing the relationship between Joel and Penny Pann. We clearly see this dynamic in play, and the characters fulfill Daum’s archetypes nearly to a T. When Joel moves in with Penny, he sticks them into an apartment that’s nearly a replica of his place with Midge. Over the course of the season, he essentially grows bored with Penny Pann, and decides to win Midge back. We — much like Midge — know what’s going on, and it’s basically a spiritual sequel to Daum’s essay. Joel wanted the idealized version of Midge as a perfect Jewish wife and mother — one, who, as Abe says in episode two, wants her husband to stay even if he wants to leave, and who keeps him there with sheer force of will. Yet when the same traits that drew Joel to Midge — her tenacity and humor, the same traits that are valued in Jewish women — make Joel feel inadequate, he leaves her for the gentle gentile alternative of Penny Pann, the sweet, simple girl who can’t figure out how an electric pencil sharpener works. (The fact that they met when she was his secretary and already habitually subservient to him probably sweetens the deal for Joel, since he knows he will be forever respected and catered to.) Even when Abe castigates Rose and Midge at various points for what he views as misbehavior, expecting them to follow his orders as the patriarch, he still maintains that they should have that iron will to keep an unhappy husband right where he is, a view shared by all four parents in the show. Penny Pann does have her moment in the sun and speaks out — or, at least, tries to, when she confronts Midge in episode eight (“Thank You and Goodnight”) for having the audacity to rekindle her relationship with Joel. Where Midge’s many dramatic outbursts are treated by the show with degrees of sympathy and dignity (her pot roast rant is a tour de force), Penny Pann’s girlish voice sounds all wrong applied to the task of confronting Midge, and she knows it. Ultimately Joel complicates the figure of the Jewish man Daum describes when he decides to go back to Midge. Unfortunately, Penny Pann never rises above the circumscribed role of WASPy lover, and never learns that being able to smile and say “that’s interesting” (à la Daum) might not be enough for Joel. Comparing the Yiddishkeit of The Marvelous Mrs. Maisel with the WASPiness of Gilmore Girls puts Amy Sherman-Palladino, the creator of both shows, into focus. With a Jewish father and Baptist mother, she was raised, as she put it in a 2013 Vulture essay, “sort of Jewish” — with Hanukkah and bacon both. Gilmore Girls has multiple Christmas episodes and exactly one Jewish character, so it’s not exactly the most obviously Jew-friendly show. But as Sherman-Palladino said in an interview with The Jewish Daily Forward earlier this year, the show’s rapid-paced witty patter of dialogue was inspired by her listening to the album 2000 Years with Carl Reiner and Mel Brooks. And the traces of Yiddishkeit in Gilmore Girls remain, to the point where Sherman-Palladino admitted “[taking] a very goyim family and [making] them Jews in inflection” — but it’s only traces. Richard and Emily Gilmore and the Maisels are arguably in the same economic strata, but their worlds are entirely different where it counts — the devil is in the details. The Maisels are the hustle and bustle of Upper West Side, while the Gilmores are suburban Connecticut, replete with perfectly manicured lawns. The Maisels’ social life revolves around synagogue gossip, fortune-tellers, and deli counters, while the Gilmores have country clubs (famously Jewish-averse) and the Daughters of the American Revolution, the ultimate WASP imprimatur. Richard Gilmore attended Yale, with Rory following in his footsteps, Yale intentionally limited Jewish enrollment until the 1960s. Naturally, Abe Weissman teaches at Columbia, which has had a historically higher Jewish enrollment, to the point where Yale alumni in the 1920s specifically cited Columbia’s then-half Jewish student body as a reason to implement a Jewish quota at Yale. The incongruity of that Marx Brothers–esque dialogue coming from Rory and Lorelai is all the more stunning when you hear it with heavy New York inflections. In the end, Mrs. Maisel can be read as Sherman-Palladino’s own enthusiastic tribute to Brooks and Reiner, the comedians who helped her “[find her] inner Jew.” She sums up her reaction to their record: “It wasn’t just the words. It was the way he said everything. And then it dawned on me. That was Jewish. That’s how it’s supposed to sound. And feel. It’s fast and furious and human and exhausted and hilarious.” With The Marvelous Mrs. Maisel, then, she’s telling a story that, despite being set in 1958, is almost autobiographical. Just as comedy helps Midge find her own voice, it helped Sherman-Palladino find hers and reconnect with her Jewish heritage. Mrs. Maisel, one assumes, is Sherman-Palladino expressing her Yiddishkeit openly rather than through more familiarly WASPy characters. And even though the Maisel-Weissman clan is observant, their religion isn’t the sole marker of their Jewish identity — applied to Sherman-Palladino’s signature Jewish-inspired dialogue rhythms, knowing that the characters are all varying degrees of observant almost further legitimizes the Sherman-Palladino-ness of it all. Her writing style, after wandering the wilderness of Connecticut (Gilmore Girls) and small-town California (Bunheads) has finally come home, and there’s a mezuzah at the door.